A version of this story appeared in Volume 6, Issue 3 of Hail Varsity. To read more great stories like this, subscribe here. Mike Riley and Danny Langsdorf had to adjust their offense on the fly when they arrived in Lincoln, shaping the scheme around Tommy Armstrong Jr.’s strengths and limitations as a dual-threat quarterback. Now, Armstrong’s eligibility has run out and the Nebraska offense will shift back towards what Riley and his staff want – a strong passing attack. Nebraska already has three new quarterback options in Tulane transfer Tanner Lee, redshirt freshman Patrick O’Brien and true freshman Tristan Gebbia. But a quarterback is only as good as his receivers, and with Jordan Westerkamp, Brandon Reilly and Alonzo Moore moving on, Nebraska needed some new ones. Enter Jaevon McQuitty, a 5-foot-11, 190-pound 4-star recruit out of Columbia, Missouri, with a knack for making tough catches. McQuitty’s story began in a small Missouri town with a population of fewer than 100 people. His family moved to Columbia when he was in kindergarten in order to give Jaevon a better life. That better life included football, which McQuitty began playing when he was 9-years-old. At first, it was merely something to pass the time, but it became much more for him. “It’s just an outlet just to be something, to make something of my life,” McQuitty said. He began at running back, until he hit a growth spurt and his coach moved him to tight end – much to his dismay. “I wasn’t feeling that,” McQuitty said. The coaches told him if he wanted to move to wide receiver he had to improve his footwork. So McQuitty asked his father to buy him some cones to do drills at home. “I was trying to get my footwork right,” McQuitty said. The coaches held true to their word, and McQuitty’s hard work paid off as they eventually moved him to wide receiver. During those years, McQuitty developed a true love for the game. When McQuitty arrived at Battle High School – a school that opened in 2013 – an upperclassman told him he would not see the varsity field, that he’d be playing freshman and junior varsity football all year. McQuitty had other he plans. He played varsity from day one, as did his best friend and quarterback Brevinn Tyler. The duo had played together since fourth grade and had already established a strong connection, which they brought with them to Battle. Any resentment the upperclassmen might have had quickly faded as McQuitty and Tyler won them over with their work ethic. Together, Tyler and McQuitty saw it all through their four years of varsity football. Tyler and McQuitty helped lead the Spartans to a state title as sophomores – Battle’s first year of post-season eligibility. Any time the Spartans needed a play, Tyler was targeting one player and one player only – McQuitty. McQuitty’s performance that season caught the eye of the Nebraska coaching staff. The Huskers invited him to the 2015 spring game, creating a dilemma for the talented prospect. He was already planning on going to a Rivals Combine on the same day. 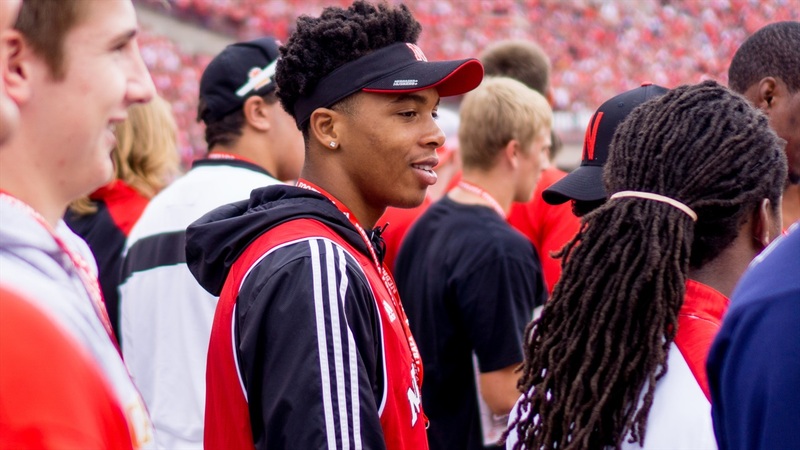 At the urging of his mother, however, McQuitty chose the Nebraska spring game and found himself with an offer by the end of his unofficial visit. “Coach (Mike) Riley, Coach (Keith) Williams, Coach (Danny) Langsdorf have developed real players,” McQuitty said. McQuitty’s relationship with Williams, Nebraska’s wide receivers coach, was and is especially strong as the two talk every day. The Spartans went 24-5 over McQuitty’s last two years and made it to the semifinals both years as he grew into a team leader and dominant force on the field. McQuitty surpassed 1,000 receiving yards as a junior, but his true coming-out party as a senior came in a 55-52 week-four win against the eventual state champion Vianney (Kirkwood, Missouri). McQuitty finished with seven receptions for 259 yards and four touchdowns. The next morning, he had to get up early to take the ACT. McQuitty graduated in December and decided to join four other recruits on campus as early enrollees at the beginning of the spring semester, hoping to give himself the best opportunity to see the field as a true freshman. He wants to learn as much as he can. Tyler said one trait will serve McQuitty well as he strives to carve out a role for himself at Nebraska: his dependability.